Light pours in through the large plate glass windows that adorn the entrance of SPARC’s performing arts building. Music reverberates down the building’s long hallways, and the melodies swirl through the nooks and crannies of its towering ceilings. In one of the first-floor studio rooms, children are painting with their hands. In another studio upstairs, children are dancing. All around there’s laughing. All around there’s art. All around there’s love. It’s just a typical day at SPARC, which for 36 years has been inspiring children like UMFS Charterhouse School’s Amelie and Sophia to reach their full potential through art. On this particular day in early May, students and staff are practicing for their annual LIVE ART event. 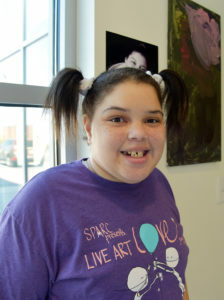 The LIVE ART program started in 2012, when Erin Thomas-Foley, SPARC’s Senior Director of Education, wanted to create an inclusive opportunity for students of all abilities to work together in a full-scale production. 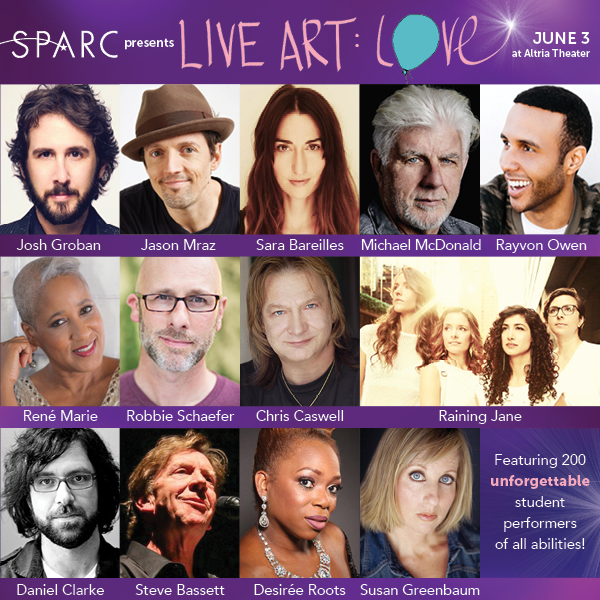 This year’s sold-out event, LIVE ART: LOVE, will be held Sunday, June 3, at Altria Theater in Richmond. The show will feature a star-studded cast of national recording acts like Josh Groban and Michael McDonald, as well as Richmond natives Desirée Roots, Jason Mraz, and Rayvon Owen. Some 200 students also will be performing, and Amelie and Sophia couldn’t be more thrilled to be among them. “SPARC is amazing,” Amelie (pictured left) said from the second-floor balcony of the SPARC building after wrapping up a Saturday morning dance rehearsal. At just 13 years old, she’s a LIVE ART veteran whose adoration for the program is palpable. “I see everyone smile and it makes me smile,” Amelie said enthusiastically. Sophia (pictured right) is no stranger to LIVE ART, either. The soon-to-be 14-year-old has been practicing diligently for her second go-round, in which she and her peers will create a large panel painting live on stage. Sophia’s already accomplished much as an artist. In fact, one of her original paintings hangs outside of Studio A where she rehearses on Wednesdays after school. LIVE ART faculty member and Charterhouse School therapist Alex Ginsberg smiled when she recalled Sophia’s enthusiasm during last year’s performance. “She showed up with this big, beautiful bow in her hair,” Alex said. Both Amelie and Sophia have put in a tremendous amount of preparation, Alex said, and she couldn’t be more proud of the two young artists. “It’s been exceptional to witness,” Alex said. UMFS is a SPARC community partner. UMFS donors Joe and Sarah Hoyle help fund UMFS Child & Family Healing Center students’ participation in SPARC’s summer camps. Follow the UMFS blog and Facebook page for a follow-up after Amelie and Sophia’s big day.